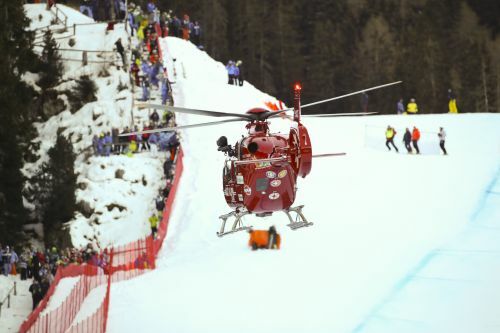 SELVA DI VAL GARDENA, Italy (AP) — Swiss skier Marc Gisin was hospitalized Saturday and is in "stable enough" condition to return to Switzerland for more tests following a nasty crash in a World Cup downhill. A rescue helicopter landed on the snow and took off for the hospital in nearby Bolzano with Gisin onboard after he had received treatment for almost a half-hour. "His condition is stable enough that he can be flown back to Switzerland tonight for further diagnoses," a statement from the Swiss ski team said. "The exact diagnoses of his injuries we expect Sunday afternoon." Aleksander Aamodt Kilde of Norway won Saturday's race.